To enjoy movies at home as you were in a real cinema room the only way is to use a videoprojector and the correct big screen. No TV set can give you the same real involvement. 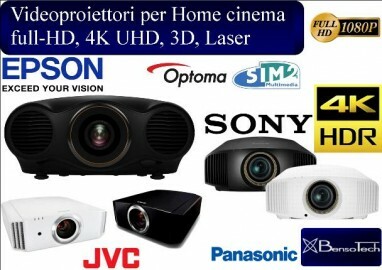 You have only to choice the Videoprojector you prefer, for resolution ( hd, full HD, 4K, 3D) definition, brightness and the correct big screen (it's very important) and the show can be started. Making the correct installation, checking every single particular as the position, cables and the sources' set, you'll be inside the movie's scenes like not even the biggest tv can do.